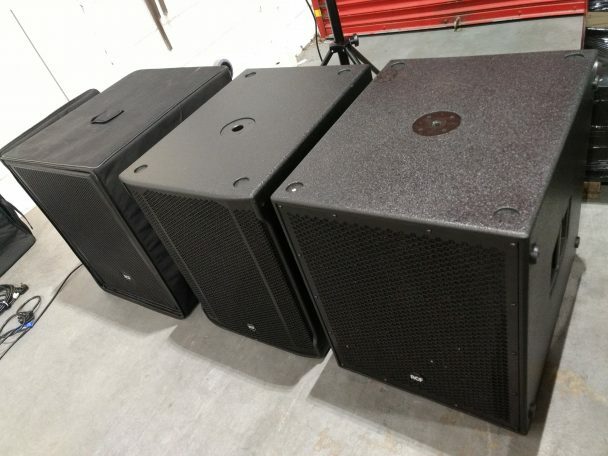 Datarhyme spent an afternoon with RCF at a major distributor’s HQ comparing 3 RCF mid-range 18in subwoofers. We tested the RCF 4PRO 8003-AS, SUB 8003-AS-II and SUB 8004-AS, along with a single RCF TT22-A providing the high frequency output. Note – This was a listening demo. No readings or calculations taken. Third generation 4PRO 8000 series subwoofer with the 8001 and 8002 models before it, known as a solid performing subwoofer. It has a digital amplifier and DSP with analogue controls. This model has now been replaced by the RCF SUB 8003-AS II. Second generation 8003 subwoofer with updated components, in particular the DSP with digital controls. Extremely low bass output can be achieved by setting the DSP. However, this may limits the available headroom. Noticeably louder than the RCF 4PRO 8003-AS, but hard to say by how much. Launched as the accompanying subwoofer for the RCF HDL line array series. It has a high output digital amplifier and configurable DSP with analogue controls. Nice deep smooth bass with a very clean sound. There didn’t appear to be much difference when deep punch was enabled. The SUB 8003-AS-II is the stand out winner based on sound quality, functionally and cost. The SUB 8004-AS is the best sounding, but with the £700 premium, that was expected.